PriceMole An easy-to-use solution that automates competitor price monitoring, repricing, drop shipping and more for you! Many sites have product pages that display different colors, sizes, flavors, styles etc. When competitor price monitoring, you want to make sure you are tracking the exact items in your catalog, especially when you are monitoring stock too. In PriceMole we would always take into account your first variant description added. But sometimes you need more than one. Now you can add your variants to the app comma seperated for dropdowns, click options and tables. This feature is still being tested and monitored, so if you notice any quirks , please let us know. Ever wonder what happens to all the data entered into PriceMole and gathered over the months? Now you can export all your competitor data for further analysis and reviews on the Settings page. Upload will be available shortly! PriceMole has a new Navbar to make it easier to navigate tha app. You will still see all of the same pages, now in a new order that offers a more efficient overview. Don't forget to check out Shopify's new App store offering a brand new look at all the apps including PriceMole! Since PriceMole is an automated system and extracts prices and stock, marks pages unavailable, interprets decimal points and much more automatically, sometimes letting little mistakes sneek in. Soon you will be able to report this directly through the app instead of having to email us. If you ever notice any issues, for example something is OOS but not showing up you can just click the report button and someone will investigate and fix the issue for you! 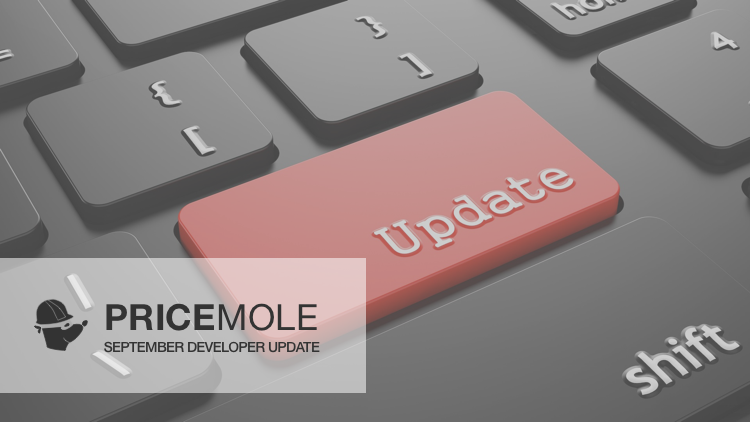 We are working on launching PriceMole on the Big Commerce App store for Competitor & Supplier Data Feed optimization and automation for all eCommerce Retailers. With PriceMole you always know what your competitors are up to. Notifications and reports will keep you informed of any changes to competitors you are tracking. Pricing strategies will automate your response and keep your prices competitive. Contact us for more details!